The Ecotex Shoe Bag™ is made from 3 recycled water bottles. By utilizing discarded materials to create new products Heys Offers an Eco-friendly choice for a clean and sustainable future. What is Ecotex ? 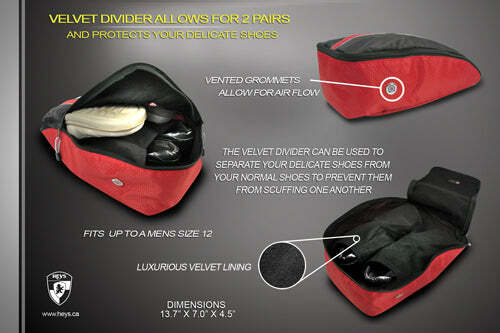 This new and improved Ecotex Shoe Bag™ fits 2 pairs of shoes. It has a velvet lined internal divider that allows you to place your delicate shoes together with your everyday shoes, as the protects your shoes from scuffing one another. The interior is fully lined with velvet, and its exterior has an innovative Dual-Vented grommet that allows for the needed air-flow. Made form durable but lightweight Ecotex. Comes with carry handle, and corded double zipper pullers which makes for easy opening and closing. Can be used as a mini-Packing Cube for organizing your socks, under-garments, laundry and much more.